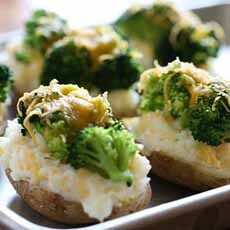 ]1] Broccoli-topped baked potato. Instead of cheddar, pick up  this Basiron Green Pesto Gouda (check Walmart or iGourmet). Here’s the recipe from Skinny Taste. Conventional colcannon in a baked potato, versus  green colcannon from Food Wishes | YouTube. Turn a stuffed baked potato into a St. Patrick’s Day spud with creative toppings or fillings. Some work with a conventional topping of sour cream and chives; others take on a personality all their own. Corned beef and cabbage: diced corned beef and sauerkraut. Check out this recipe for Reuben Stuffed Potatoes. Green vegetables: favorite cooked green vegetables(photo #1). Salad: Lightly dress a salad of baby spinach and baby arugula or watercress, and top the potato. 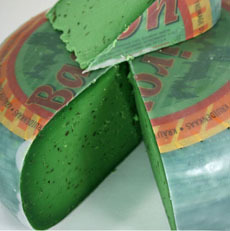 Shaved green cheese: Use Basiron Green Pesto Gouda (photo #2). Sour cream and green tobiko. Sour cream tinted green, topped with minced chives. Spinach dip with lots of spinach and a sour cream base. Pesto mashed potatoes: Scoop out the potatoes, mix with bright green pesto, season and stuff the potato shell. 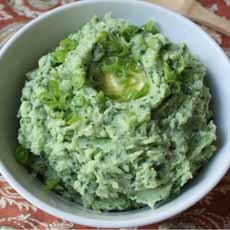 Colcannon: Make the special green colcannon recipe, below. You can fill the baked potato, or eat the colcannon straight. Thanks to Chef John for making colcannon more green for St. Patrick’s Day. Colcannon is a traditional Irish mashed potato dish made from potatoes, kale or cabbage, milk or cream, butter and salt and pepper added. It can also contain a member of the onion group: chives, green onions (scallions), leeks or regular onions (different types of onions and how to use them). 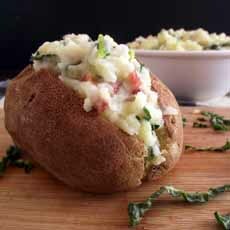 Chef John makes the traditional colcannon (shown stuffed in a baked potato in photo #3) more green, by adding more kale and green onions in addition to the leek. 1. BOIL the potatoes in a large pot of salted water until tender, about 10 minutes. Drain and transfer to a large bowl. Add 2 tablespoons of butter and lightly mash the potatoes. 2. BOIL the kale and leek in a large pot of water until tender, 5 to 7 minutes. Drain and transfer to a blender. Add the white parts of the green onions and 2 more tablespoons of butter. Blend until smooth, scraping down the sides as needed, 1 to 3 minutes. 3. STIR the puréed kale mixture into the bowl of potatoes, and continue to mash. Season with salt and pepper to taste. 4. ADD the cream and stir until the desired texture is reached. Garnish with 2 tablespoons of butter and the green parts of the green onions. For a baked potato, the optional butter is not required. Just garnish with the green onions.